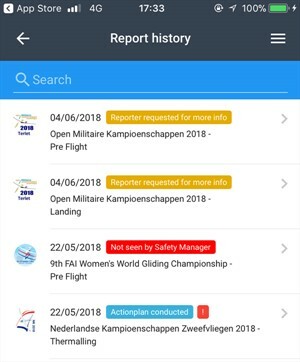 Flytool Competition, the digital Safetybox, to collect data from Pilots, Team Captains, Officials, and Organisers during a competition via the Flytool app or website. Easy in use, a manual is hardly needed. The project started in the Netherlands as an online safety registration system for the whole General Aviation being an European requirement. The Dutch NAC (Royal Netherlands Aeronautical Association, the KNVvL), was one of the organizations involved in this project, including Frouwke Kuijpers, head of Sport&Training. Besides that, she is also the Dutch IGC delegate and member of the IGC Steward Working Group. During a shared meeting between the IGC Safety group and the IGC Steward Working Group the idea arose to develop a special edition, Flytool Competition, an online registration tool especially for competitions. The digital Safetybox was born! The main focus is on safety items, but it can also be used to give feedback on the championships organisation itself, just like the old fashioned Safetybox in the briefing room always had functioned. Thanks to the online registration and the archive feature (!) future events can learn from previous events. With this information organizations can improve the quality and safety of competitions. Flytool Competition can be used for free, also in the future. As mentioned before, this tool is easy in use and although there is a guide, it hardly will be needed. In the report, you can upload pictures and logfiles. There is a Map-link to adopt a precise location in the report and a METAR link to download the actual weather. 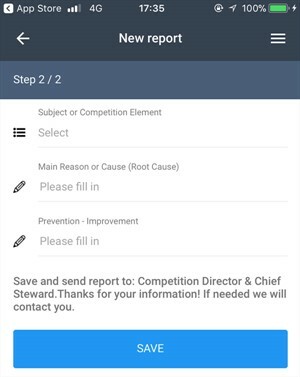 Reporting forms contain links, smart fields and selection, pop up menu’s to facilitate an easy fill out of a report and as such, assures consistency in reporting. Not only in between reports but especially also in between the various competitions through time. Another advantage of the new tool is that the status of the report easily can be monitored by the one who submitted it. No black holes anymore for the reporter, after issuing a report. The Response time on reports issued, is diminished as organizers instantly get a notification once there is a new report. The reporter as well will be notified about any status change of his report. So actions taken and changes made, easily can be monitored. Furthermore, FlyTool guarantees confidentiality through de-identification of the reports and data encryption. All data will be saved in one big data base, enabling monitoring the reports of one single competition, but also there will be an overview of all competitions which have registered. Analysis and monitoring trends will be more accurate and easy to accomplish, it may lead to changes not limited to only one competition, but up to different topics. In short, Flytool Competition makes things easier. You can test this application in “Sample Competition”. This competition you can select after registration in FlyTool according number 1 and using animation number 2..